This little treasure box of stories from USA Today bestselling author Catherine Stine contains three offerings. The first is Blue House Magic, the sequel novella to her futuristic Fireseed series. The second is a story called A Strange Penitence. The third is the first chapter of Fireseed One, which kicked off the Fireseed series. This collection is a great introduction to Stine’s work. 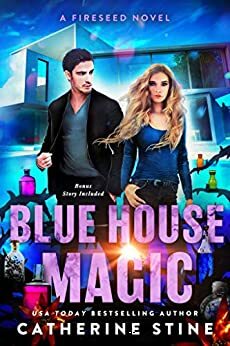 Blue House Magic: Can Ruby, a talented seer find a cure for the baffling plague drifting down from the enemy north before it's too late? A Strange Penitence: A young artist pays a supernatural price when a drawing trip turns deadly. Fireseed One: Set on the future earth, the son of a famous marine biologist must travel to a lethal hot zone with his worst enemy, a girl who helped destroy the world’s food source, to search for a mythical hybrid plant that may not even exist. I'm a fan of the fantastic Fireseed series, and this collection reminded why. Catherine Stine's writing is poetic and compelling. She creates vivid images with beautifully flowing words. 4.5 stars! Blue House Magic: Ruby needs to find a cure for a horrible plague, but is she helping the enemy? A great peek into the post-apocalyptic world where everything that grows has burned up except for the Fireseeds. Heart-breaking and suspenseful. A Strange Penitence: A young artist goes to forbidden places to seek out quiet, natural spots for her art. Sometimes, these places are dangerous. You can tell an artist wrote this with the wonderful way she describes the colors and flow of paint. Yet the story turns dark when the woman is interrupted. Heart pounding and twisted! Chapter 1 of Fireseed One: I've read the book before and loved it. An incredibly unique and fun YA futuristic thriller. It takes place in the not so distant future and makes you wonder if this is what could happen if the polar ice melts. A sample chapter from the book Fireseed One (which I'd previously read) and two short stories. One of the short stories is billed as a sequel to Fireseed One, but it reads more like the start of a third book in the series. Good writing but not much of it.